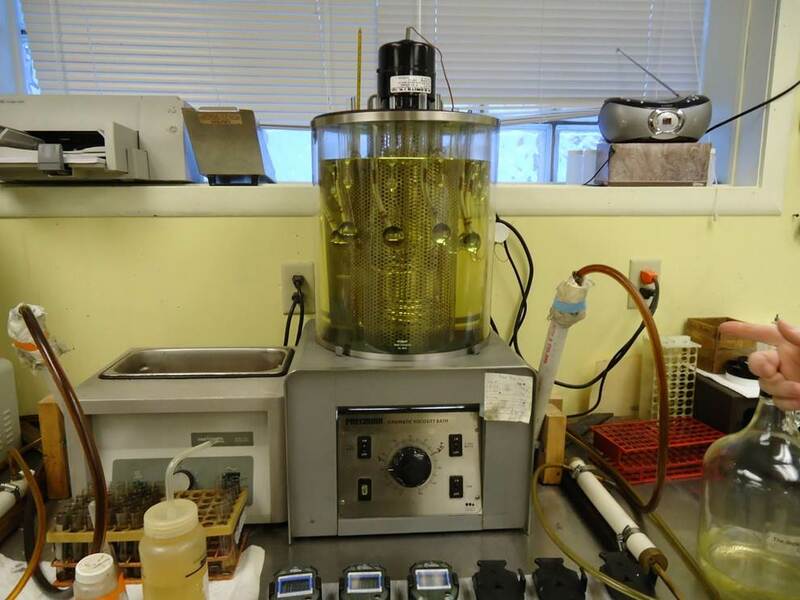 Used Oil Analysis – we all talk about it, and many can understand the results, but few people have had the opportunity to actually see how the process works. 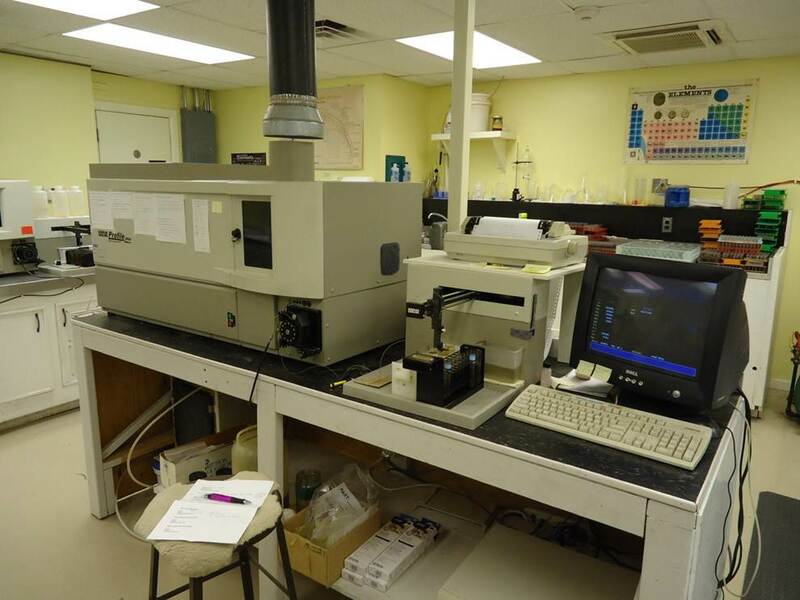 One of the more popular analysis labs is Blackstone Laboratories of Fort Wayne, Indiana. If you want to learn more about Blackstone (location, history, available services, people …) you can visit their website at blackstone-labs.com . Blackstone’s website is very informative, and laced with personal notes and a wee bit of humor! BITOG is proud to have Blackstone as one of their longest-running site supporters. On January 13th, 2012, I visited Blackstone Labs for the purpose of documenting the process that our samples go through when being tested. My guide for the morning was Ryan Stark. Please note that it is not the intent of this article to reveal the minute details of lab technology, but rather give an oversight as to what happens to your sample. Stark notes that they are a “production lab” set up to serve the lubricant industry, and are not a science lab rooted in research and development. 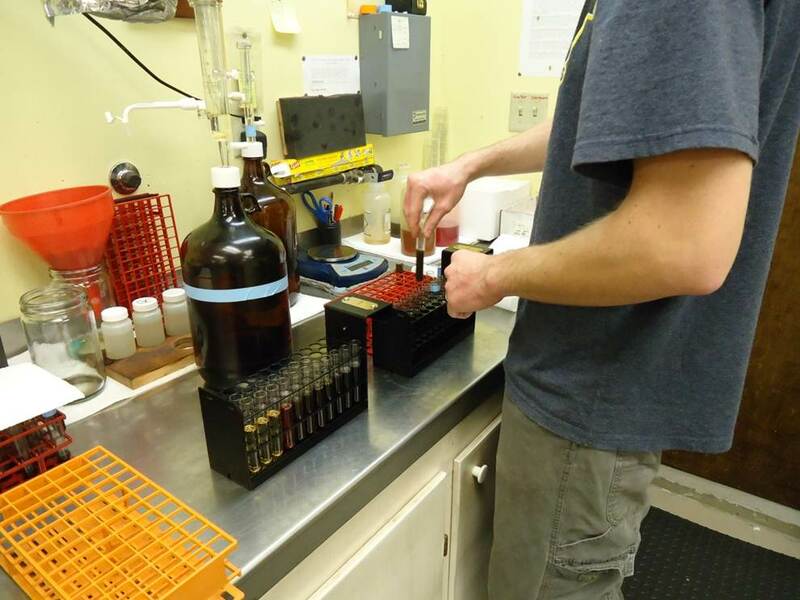 Blackstone processes approximately 200 samples a day. The samples, most of which are received via US mail, are segregated upon receipt. The fluids are tested in group lots of 36 samples. Because Blackstone serves many industries, they take in many types of sample lubricants; automotive engine oils, gear oils, transmission fluids, differential fluids, hydraulic oils, etc. Of note, they serve a large portion of the aviation engine oil analysis market. Because those piston-engines still run on leaded fuel (! ), those samples can have upwards of 5000ppm of Pb in their oil samples. They are therefore run at the end of the 36 piece sample grouping, so that the very-high lead counts won’t contaminate automotive oil samples. 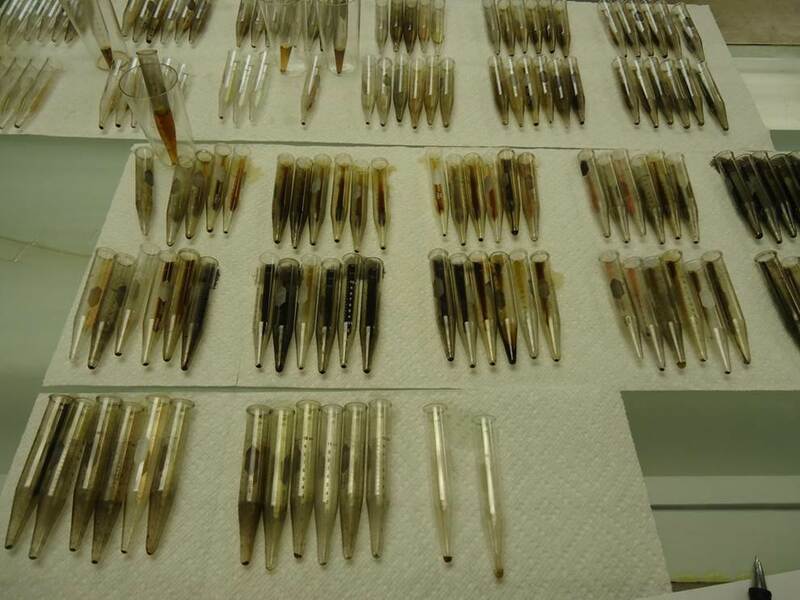 Most samples are run in 12-48 hours after being received, simply dependent upon oil type grouping, etc. Once the samples are brought in and separated, your sample is assigned a number for the purpose of tracking the various results throughout the process. If you are an existing customer, your sample is linked to your file; if you are a new customer, a new file is created for you in addition to the sample number. 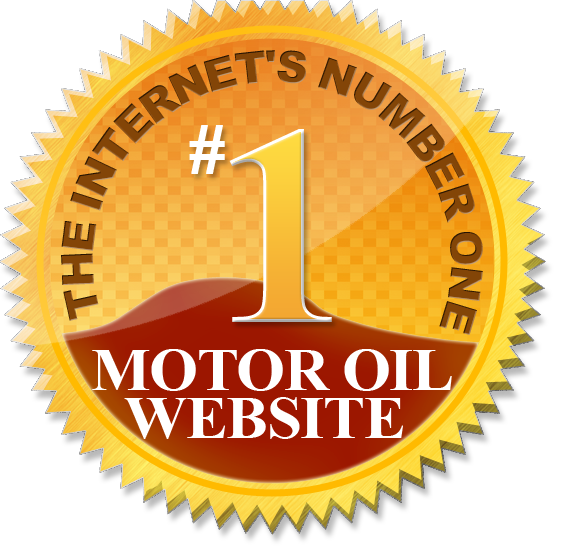 It typically takes one or two hours for a complete battery of oil testing. If you have used their service, you’ll recall that the little sample bottle holds about 3oz of fluid (approximately 90ml), and perhaps 2oz is needed for one specific test; more on that later. There is enough fluid left in that last 1oz (30ml) that the rest of the testing can be done, and still have “left over” fluid for re-testing, should it be necessary. The analysts work together in the testing room, and there is a lot of coordination going on. The first draw of fluid is taken out for three different tests. 13ml of fluid is drawn out and dispersed into three different small test tubes; 7ml for the viscosity test, 5ml for the insoluble test, and 1ml for the spectral analysis. Interesting, is it not, that one of the most technological parts of the test process only needs 1ml out of your 90ml sample! 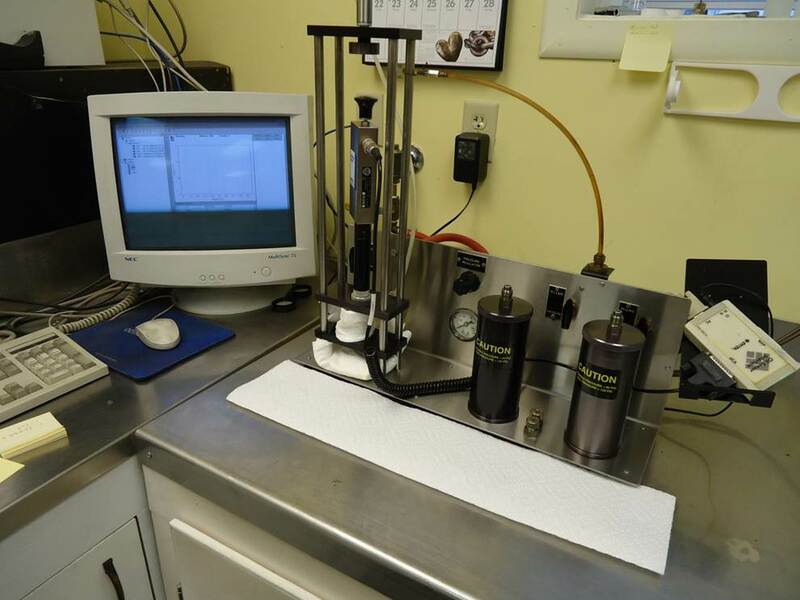 The viscosity is measured in two separate testing machines. 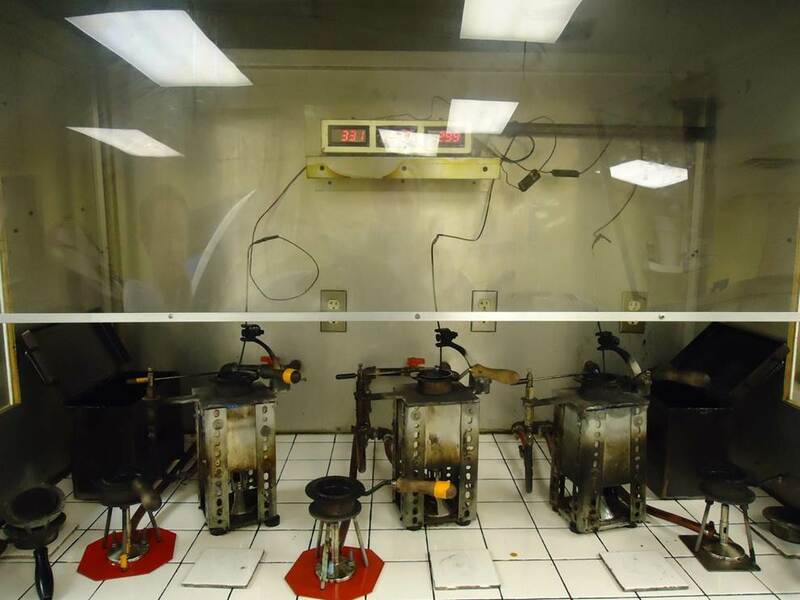 One is set up for 100 deg F, the other at 210 deg F. The machines themselves are identical; it is the test tubes used in each machine that are calibrated for each temperature. The tubes are very intricate, with a detailed shape which includes two bulbous bulges. Specifically, there is a small capillary channel between bulges in the main tube, and that capillary channel is what is calibrated for a particular temperature. You could ask for your viscosity to be tested at 175 deg F, and they would have to either “estimate” the result, or get a tube specifically calibrated to that temperature. For the typical oil market, 100 deg F and 210 deg F are the accepted standards, so that represents the tubes they use. The tube is open on each end, so oil is introduced in one side and allowed to settle for heating. 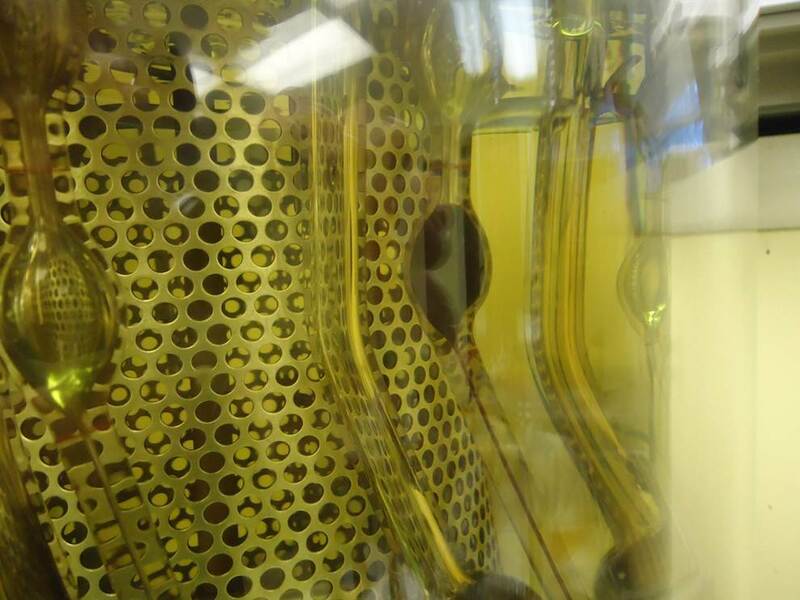 The oil is heated to the full temp, and then a vacuum tube is placed on the other end so that the oil is drawn up into the higher bulge, above the marked lines. The vacuum is then removed, and the oil flows back down through the small capillary orifice (it is conceptually similar to watching a fluid flow in an “hour glass” effect). The variant of time indicates the relative viscosity of the fluid. The time for the fluid to move from one bulge to the other through the capillary is measured via stopwatches, and then manually input into a computer file for your sample. The spectral analysis is done in a Leeman Labs ICP machine. “ICP” refers to “inductively coupled plasma” and is the preferred method according to Ryan. The machine calibration is validated twice a day, and a “check sample” of known quality is run every 9th sample, to verify consistent results. That process speaks well of the integrity of their testing protocol. 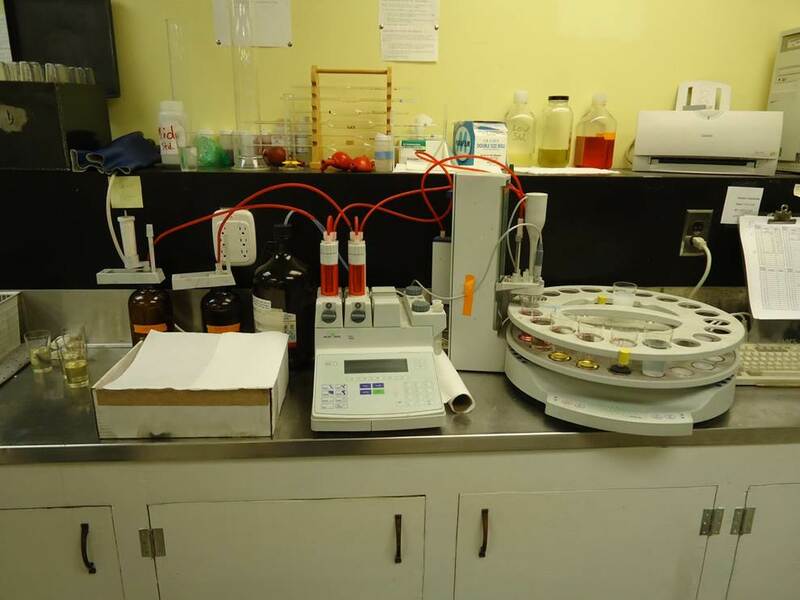 The system is fully automated, as even the samples are drawn up with a small rotary pump from syringe stylus probes driven by computer for each sample. The sample is not run “full strength” but is cut with another fluid; 1ml of sample oil is added to 8ml of kerosene. The details of the technology are too deep for the intent of this article, but essentially, radio frequency waves are used to excite the atoms of argon gas to a state of plasma at 10,000 deg F. The sample mixture is then introduced into the plasma, and the elements burn completely with energy signatures unique to each element. 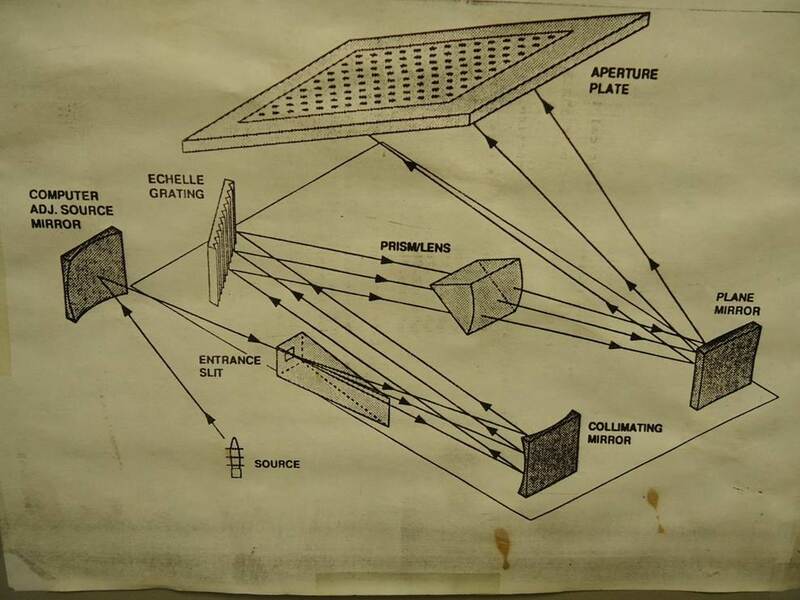 That energy is sent to an aperture plate via a series of lenses, reflection and refraction. The end result is the ability of the test equipment to identify and quantify elements; type and magnitude are determined by the energy wave forms present. The spectral ICP test takes approximately two minutes; they have two machines. Typical elements found include additives and wear metals, as well as the inference of coolant via sodium/potassium presence. The data is collected, and sent automatically to a computer server that stores the data until needed for your report. Next we reviewed the 5ml of fluid for the insoluble test. Your 5ml of oil is mixed with 5ml of ether-based liquid, and vigorously shaken to mix well. Then the samples are spun in a centrifuge for 10 minutes. The heavy solids end up at the bottom of the tube. The mixture is then poured out, and the solids stay in the bottom of the tube. That mass is then measured against known standards for size and color, and graded as a result. Data is manually entered into the server. Flashpoint and water contamination are measured in a very accurate, but somewhat “low tech” method. Two ounces (60ml; the vast majority of your total sample) of oil are placed into a metal cup, and then slowly heated from underneath the cup. Barely above the cup is a small gas flame tip. A thermocouple is placed in the oil. As the oil heats up, it will eventually get to a temperature where is begins to evaporate, and that evaporation contains combustible gasses. When that combustible gas ignites, it indicates the “flash point” (the point at which a “flash” of flame can be induced). Fuel contamination such as gasoline and diesel will lower the flash point. That FP temperature is noted, and manually entered into the computer system. Water in the oil will “boil” well before the oil will “flash”, and so the technician can hear the sizzle and pop of water escaping the oil. If you’ve even splashed some water into the frying pan at the stove, you know exactly what it sounds like. TBN/TAN tests have become very popular, especially with persons wanting to validate their fluids for continued extended service. Many years ago, TBN was simply tested with a small “box kit” offered by Dexsil. Now, TBN/TAN are tested on a Mettler Toledo DL53 pH balance machine; this method is quicker and more accurate. 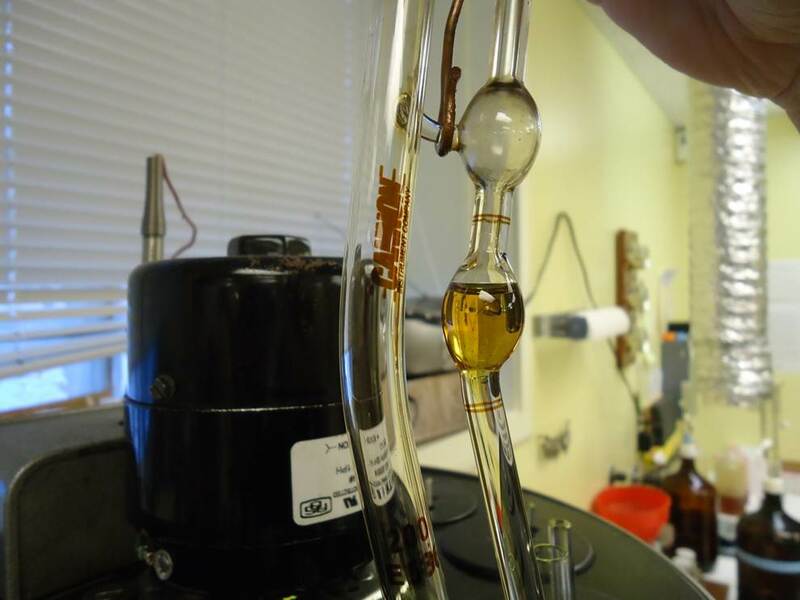 Two grams of oil are mixed with an alcohol titration mix, and then processed. The test itself is totally automated. Samples are loaded into the small containers, and the machine does the rest, including its own purge and self-check samples. For confirmation, a known sample reference sample is run each day; typically they use 10w-30 HDEO. Stark estimates that 75% of BITOGers get TBN tested, while perhaps only 20% of the rest of their clientele get TBN tested. TAN is tested infrequently for BITOGers; it is more prominent in their industrial customer base for hydraulic fluids, etc. Result data is sent to the server. because it is not susceptible to entrained air or water, unlike the laser method. 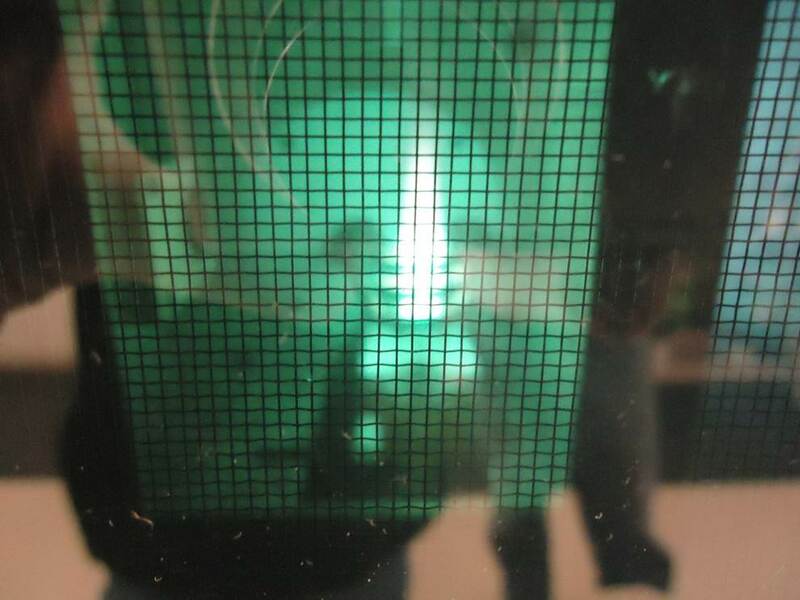 The sample is sent through the pore-screen at 60psi, and then analyzed for the quantity of particles trapped by the screen. The “normal” screen is 15um, but they have other sizes. To wrap up the process, they prepare your oil report. After your battery of tests is completed, the analyst pulls your sample number into the report, and then reviews it for accuracy and any notable issues. They will also compare/contrast your results to those of “universal averages”. Those averages come from equipment just like yours; engine to engine, transmission to transmission, etc. They take pride in personally contributing comments to your UOA; it is what sets them apart from their competitors. If warranted, they have even been known to call you should an alarming condition arise so troubling that waiting for the report might risk significant damage. Typically, your report is emailed to you. Hopefully you will now have not just the knowledge of what’s in your report, but what happened to create and process the report.